"Our strategy is to make journalism worth paying for"
"We measure our success by the number of people who pay us to be subscribers in print and in digital." “We are in this for the long term ... Our horizon is the next 100 years,” said Michael Golden of The New York Times, during the Opening Session of IFRA Publishing Expo and DCX on Tuesday in Berlin. "The New York Times has been under the control and the active senior management of the Ochs-Sulzberger family for 120 years," he said. "Obviously, we manage the business on an annual basis, but we believe we will be one of the most successful digital businesses." 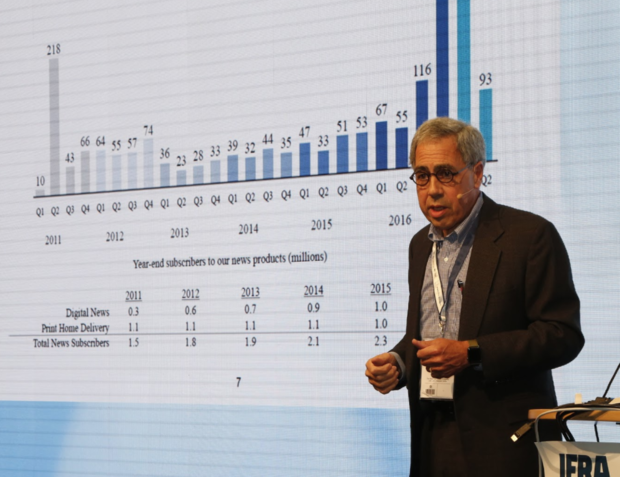 Golden, Vice Chairman of The New York Times Company and President of WAN-IFRA, shared recent developments and The Times' strategy with the standing room-only crowd. "Our strategy is to make journalism worth paying for," Golden said. "We measure our success by the number of people who pay us to be subscribers in print and in digital." Right now, he said, The New York Times has about 1 million subscribers in print in various forms: Sunday-only, weekend, 7-day. All of those subscribers have full access to The Times' digital offering. They also have more than 2 million digital-only subscribers who pay between $225 and $450 a year for NYT digital subscriptions. "In addition to that we have more than 200,000 subscribers to a crossword product, which is doing very well," Golden said. He also said that The Times' short-term goal is to reach $800 in million digital revenue. "One of the big changes that we have made in the last two to three years is that we are very focussed on audience-first," he said. "Advertising is critically important to our business, but we do not believe it is the future of our business. We believe it's much less dependable, much less available to newspapers and news organisations and that audience-first and audience revenue is the key to it." Being a news destination is critically important to The Times' strategy, Golden said. "We need people to come to our website, to come directly to our journalism," he said. "That's how we think you really build a relationship and really build value. We use Facebook. We use Google. We use social media to bring our audience in, but we work very, very hard to bring them directly to The New York Times. We cannot rely on them coming solely through social media." He said The Times' core appeal will remain national-international news, science news, culture news, that they are well known for worldwide. "But we believe that if we are going to get to 5 million, to 10 million digital-only subscribers, then we have to have more touch-points, more areas in your daily life where you see The New York Times as an authority," he said. "Everything we do in one way or another is to increase engagement," Golden added. The test for success is if you can engage consumers enough to return again and again. Not if you can bring in a lot of people once, he said. "Readers have stayed with print because it is a different experience, an experience they value," Golden said. "I believe that we have a significant number of years ahead of us in print – I am not going to put a number on it because then everyone will focus on the number. We are aggressively building our digital business, but personally I believe that we'll be in print for another generation."